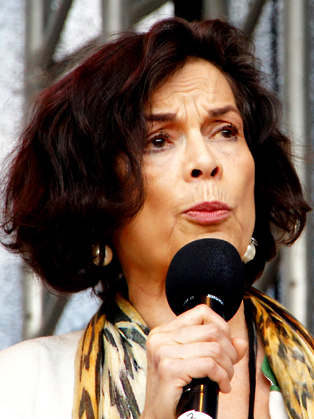 Bianca Jagger is a prominent international human rights and climate change advocate. For over 20 years, Bianca has campaigned for social and economic justice and environmental protection throughout the world. She is Founder and Chair of the Bianca Jagger Human Rights Foundation, Council of Europe Goodwill Ambassador, Member of the Executive Director's Leadership Council of Amnesty International USA and Trustee of the Amazon Charitable Trust. Her work has been award-winning, receiving the Earth Day Award from the UN in the 1990s, as well as the Green Globe Award from the Rain Forest Alliance, and an 'Abolitionist of the Year' award from the US National Coalition to Abolish the Death Penalty. Bianca Jagger is a prominent international human rights and climate change advocate. She is Founder and Chair of the Bianca Jagger Human Rights Foundation, Council of Europe Goodwill Ambassador and Member of the Executive Director's Leadership Council of Amnesty International USA. For approximately 25 years, Bianca has campaigned for human rights, social and economic justice and environmental protection throughout the world. For her work in these areas, Bianca has been the recipient of many prestigious international awards, not least of which is the Right Livelihood Award, also known as the “alternative Nobel prize”. Others include the United Nations Earth Day International Award, the Amnesty International USA Media Spotlight Award for Leadership and the World Citizenship Award from The Nuclear Age Peace Foundation. She also received the World Achievement Award from Mikhail Gorbachev. Bianca was born Bianca Pérez-Mora Macías in Managua, Nicaragua in 1950. As a teenager, Bianca observed the terrors the Somoza National Guard inflicted on the civilian population. She felt powerless, since all she could do was participate in student demonstrations to protest against these massacres. From a young age, she witnessed what John F Kennedy defined as, “the harshest common enemies of man: tyranny, poverty, disease and war”. In the mid-sixties, she left her native country armed with a French Government scholarship to study Political Science in Paris. In 1971, she married Mick Jagger. During the 1980s, Bianca began her long association with several international human rights organisations, most notably with Amnesty International, Human Rights Watch and the Washington Office for Latin America. In the 1990s, as part of her continuing human rights and environmental efforts, Bianca began to campaign on behalf of indigenous populations in Latin America. She declared a commitment to help save the tropical rain forests of the Western Hemisphere. Her efforts brought her to Nicaragua, Honduras, and Brazil. In 1991 she proved instrumental in stopping a logging concession that would have endangered the Miskito Indians’ habitat on the Atlantic coast of Nicaragua. In 1994, she participated in a similar effort to protect the Yanomami people of Northern Brazil from invasions of their lands by the influx of gold miners, who were polluting the water and causing many deaths among this ancient tribe. In recognition for her efforts, she was presented the 1994 United Nations Earth Day International award. In 1997, she was the recipient of the Green Globe award by the Rain Forest Alliance, “for her extraordinary conservation efforts and achievements over the past ten years”. In 1995, the United Nations “safe area” of Srebrenica in Bosnia was overrun by Bosnian Serb troops. Some 8,000 civilians (virtually the entire male population) were systematically massacred. For many years she campaigned to stop the genocide taking place in Bosnia and, later, to make the perpetrators accountable before the International Criminal Tribunal for the former Yugoslavia (ICTY). She has testified on this issue before the Helsinki Commission on Human Rights, the United States Congressional Human Rights Caucus, the International Operations Subcommittee on Human Rights, and the British and European Parliaments. From 1993 to 1996, she evacuated 22 children out of Bosnia to receive medical care in the United States. In the mid-1990s, Bianca began campaigning against the death penalty. In 1996, Bianca was made recipient of the “Abolitionist of the Year Award” by the National Coalition to Abolish the Death Penalty for “her tireless efforts and heroic dedication in achieving clemency for Guinevere Garcia”. Since then, she has campaigned on behalf of many capital punishment cases and she continues to campaign against the death penalty throughout the world. Bianca was Chair of the World Future Council and served on the Advisory Board of the Coalition for International Justice. She was a member of the Twentieth Century Task Force to Apprehend War Criminals and a Board member of People for the American Way and the Creative.